Today I wanted to show you a little box I made for an Easter gift. This little cross box is the perfect size to hold some yummy Lindt Truffles or other yummy treats for Easter. I have one very special person in mind for this. :) This week's ODBD Shining the Light Challenge is to think Easter! Why not play along? I covered the chipboard cross with yummy shimmery designer paper from SEI (Chocolate). It is a silvery paper with little gold sanded lines throughout. It's so elegant! 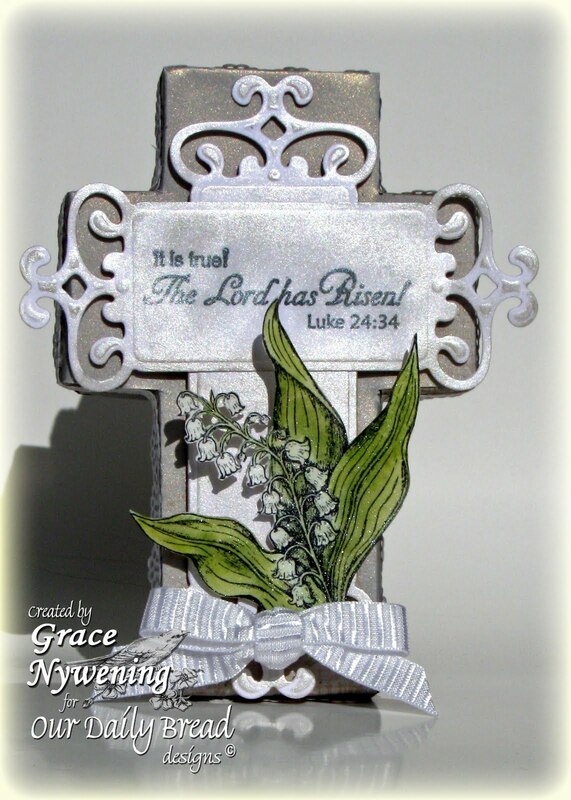 I decorated it with the March release Our Daily Bread designs set Easter Blessings (the Lily of the Valley) and The Lord has Risen (the sentiment). I used the Spellbinders Fancy Tags which I sponged with Brilliance Platinum Planet Ink. It really gives it a shine. To make the Fancy Tag longer for the vertical panel I cut it and taped it to the back of the horizontal panel so it would better fill the cross. I then adhered them to the box with pop dots to give more dimension. The Lily of the Valley is watercolored and then cut out, and sprayed with Tattered Angels Glimmer Mist in Pearl for LOTS of shimmer! I added some white ribbon to the bottom of the flower. For the lid, I added some self adhesive paper ribbon from K&Co. This little box holds 6 Truffles. Thanks so much for stopping by today! Please be sure to stop back on April 1 for a new release and a lot of fun for all!!! Check it out at the Our Daily Bread designs blog on the first! For a sneak peek at what's coming just scroll down one post. Just one of four GREAT new sets coming Thursday!!! See you then! Good Morning Grace!!! WOW sweetie what an awesome box you created, this is GORGEOUS...LOVE the design and sooooooo creative!!!! BEAUTIFUL~! This is truly beautiful, Grace!! Don't you just love altering?! This is so exuisitely lovely, Grace. The perfect Easter project and message to celebrate the most joyous day of the year. I LOVE when you amke these Cross boxes. They are incredibly beautiful!!!! AWESOME WORK!!! Wow I am at a loss for the correct words! Your Cross Box is Beautiful I just love it! What wonderful outstanding, Gifted and so talented. You have created A beautiful Piece. What a magnificent box, Grace! 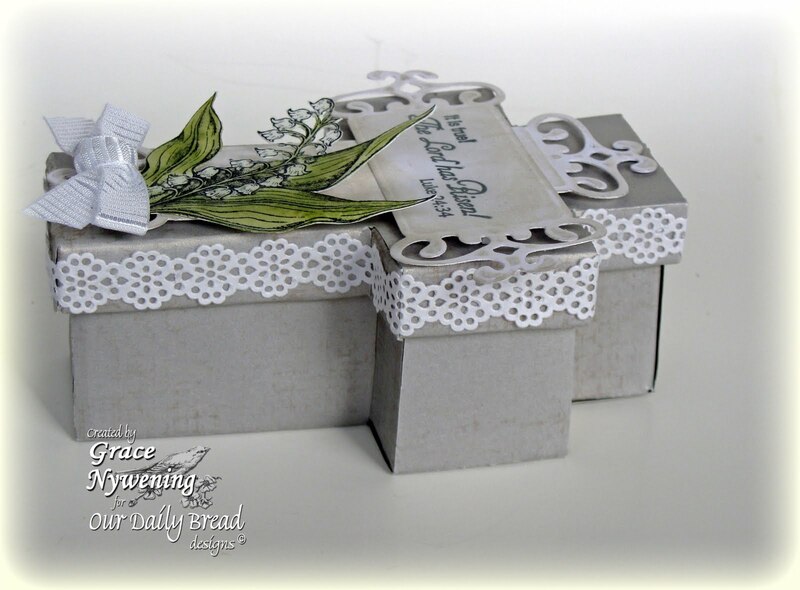 I just love that lily of the valley image and you've given me a great idea to pair it up with a cross image! Happy Easter to you! Oh, Grace ! This is pure gorgeousness ! I must CASE this ! Where did you find this box ? Have a blessed Easter, dear friend ! This is gorgeous Grace!!! Love the border. and the use of the fancy tags die!! You are so creative and talented girl!! This cross box is incredible gf! very classy project! Thank you for joining the SFTW challenge this week and good luck. OH WOWIE! This is super amazing Grace. LOVE the cross box... love the fancy tags on there like that and love your flowers and border! Now you just head straight on over to Awesomeville!!! Do not stop, do not pass Go, just go there! This is a gorgeous Easter creation! Thank you for joining us at Fussy and Fancy Friday!